We’ve got an exclusive guest post for ya from Tom Frampton, mix and mastering engineer, and the man behind the Mastering the Mix Plugins: EXPOSE, LEVELS, ANIMATE, and REFERENCE. Tom’s a weapon in the studio and he specializes in using his cutting-edge plugins to dissect and help you learn from anthem tracks. In this post, you’ll find some serious nuggets of engineering wisdom, as well as links to free trials for all the Mastering in the Mix plugins. Here’s Tom! Flume ascended to stardom at the age of 21 when his debut self-titled album topped the ARIA album charts and reached double-platinum. 4 years later he released his second album ‘Skin’ which won the best Dance/Electronic album at the 2017 Grammy Awards. The lead single on this incredible album was ‘Never Be Like You’. In this post, I’ll be decoding the mix of ‘Never Be Like You’ to see what we can learn from Flume’s approach to making music. We can then use these techniques to help guide our decisions to get great results in the studio. Why was ‘Never Be Like You’ so successful? How did it manage to get so many radio plays and still maintain it’s artistic credibility? The songwriting and production have a great balance of simplicity with novelty injected at the perfect points. For example, the chord progression is relentlessly simple: C, Dm, F, repeated all the way through. This creates an easy-to-digest foundation upon which the vocal can add more complex and unusual melodies. When the listener hears the instantly recognizable high-pitched fastpaced “Never Be Like You” vocal, it grabs their attention. Why? Because it’s so different and unique. Once the listener is pulled in, how does the track keep their focus? Read on to find out. 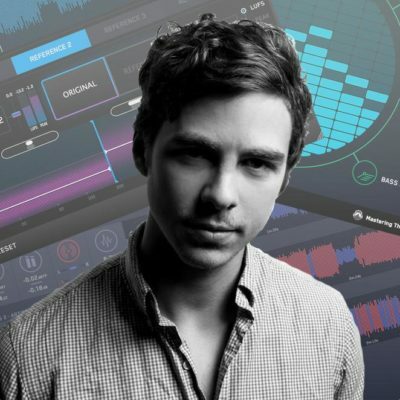 Flume makes the track easy to digest by keeping the arrangement (choice and number of instruments) minimal. ‘Never Be Like You’ is dominated by just a few main elements; the bass, drums, a synth, and the vocals. Just having these four elements makes it easy for the listener to stay engaged with the music. A production with lots of instruments battling for the listener’s attention can often lead to the listener losing the will to stay focussed. What can we learn from this? When we’re producing and mixing, often it’s better to use fewer sounds rather than adding layer upon layer to your mix. Too many layers can make a mix sound bloated and ends up confusing the listener. With the next song just a click away, it’s important to grab your listeners attention and keep it from start to finish. 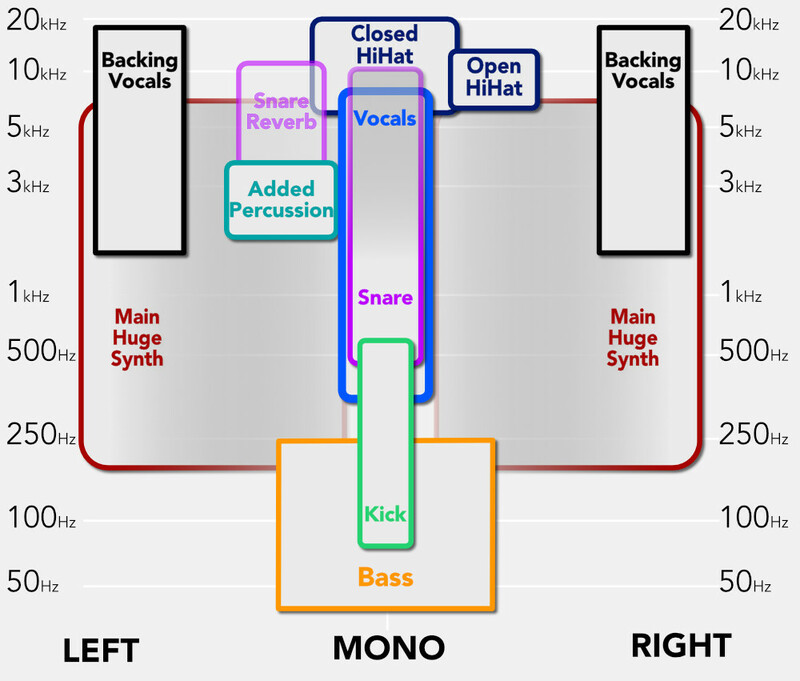 Take a look at the stereo separation infographic below. There is a little bit of overlap as is expected in any mix, but each element has its own place. The ‘Vocals’ and the ‘Main Huge Synth’ occupy very similar frequencies, however, the ‘Vocal’ is positioned right down the middle in mono and the ‘Synth’ is spread super wide. This minimizes the conflict between the two channels. Same goes for the kick and the bass. The bass is actually positioned fairly wide in the mix and the kick is totally mono. A notable characteristic of the mix is the panning of the percussive elements. There are a number of snares, hi-hats and percussive elements that jump in and out of the mix in an unpredictable way. This spices things up when listeners are used to hearing channels positioned statically in a mix. What can we learn from this? When there is a frequency conflict in your mix, utilize the stereo width to add separation and clarity. Try peppering in some unpredictability to your panning and stereo placement to add some novelty. Having analyzed a lot of mixes, I’ve discovered that most producers add a touch of stereo width to the bass to give it some separation from the kick, however, Flume took this a little too far in my opinion. 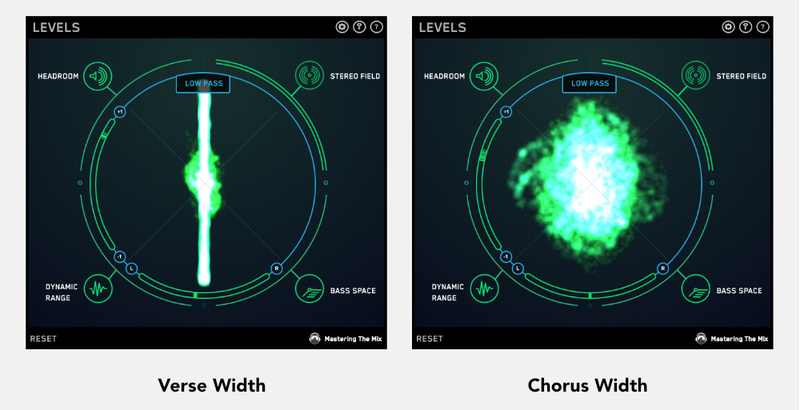 Check out the image below of LEVELS highlighting the width of the low end. The red in LEVELS shows that phase cancellation is going to affect the tonal balance of your track in mono. You can hear this for yourself if you listen to Never Be Like You in Mono. The bass becomes exceptionally weak and the main synth also sounds quite different. It’s important to make sure your track translates to mono well, especially if your track will be played in a club (where audio is almost always output in mono). To avoid phase cancellation issues, I recommend that you mix your low-end fairly mono and make sure you use quality stereo widening plugins and techniques. The best test is to monitor your mix in mono through one speaker, if you’ve done a good job the balance will be similar. A great song often has a chorus that comes in with an epic entrance. Listeners want to have that moment where the track builds and climaxes. For that to happen the sections have to contrast. If both the ‘build-up’ and the ‘climax’ have very similar technical properties, then your listeners won’t notice much of a difference. Let’s look at two ways Flume contrasts the sections in Never Be Like You. Having a track that sounds super wide is great, but if you’re constantly pushing your track to the edges of the stereo spectrum then you might not be achieving your goal in the best way possible. If everything sounds wide, then nothing feels wide as relativity plays a large role in how we experience music. Flume’s approach to this was to mix his verse fairly centrally, then burst out of the speakers with a super wide chorus. By framing the audiences reference point and giving them an almost mono verse, when the chorus drops it feels like a dramatic contrast. It lifts the chorus up and makes it the star of the production. It wouldn’t have had the same effect if the verse was also wide. The verse and chorus also have a dramatically contrasting dynamic range. During the verse, the arrangement is a little more sparse driven mainly by the vocals and drums. When the chorus drops, the bass and synth are at full throttle hitting the listener with a wall of sound. As we can see in the visual below, LEVELS is showing that the verse is 11.1DR and the chorus is 6.3DR. This dramatic change gives a clear signal to the listener that the music has moved to the new section. It makes it easy to listen to and digest. Spotify streams this track at -14.5 LUFS int. The normalization algorithm turned the original track down by about 6dB. That is quite a lot of headroom that could have been utilized to create a punchier, more open and less compressed master without sacrificing end-user loudness. Even pulling back off the limiter by 2dB can sometimes make all the difference between a squashed mix and an open mix. For a great example of a dynamic track that still sounds super powerful, check out KOD by J Cole. The loudness range of 6.3LU shows that is has a considerable dynamic difference between the different sections of the song. EXPOSE is showing that the mix actually favors the left a little more than the right. This isn’t very surprising given that the production uses some unconventional panning. More often than not people like to listen to music that is well balanced between the left and right speaker. The red lines in the waveform show all the points in the track where the song is either unbalanced between the left and right speaker and the points where phase cancellation would occur. Unique and novel melodies can grab a listeners attention. Having just a few main elements in a song can make it easier for the listener to keep focus. When there is a frequency conflict in your mix, utilize the stereo width to add separation and clarity. Wide bass can sound weak in clubs. Mix your low end fairly mono and make sure you use quality stereo widening plugins and techniques. Use width and dynamic range to contrast the verse with the chorus. 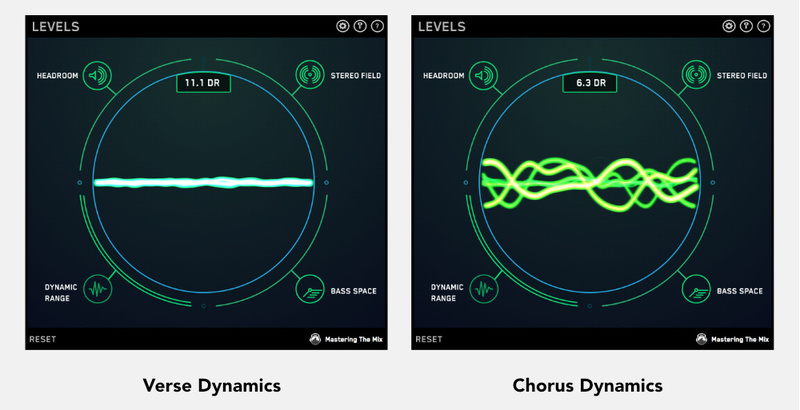 Going for a dynamic approach can make your masters sound less compressed on Streaming platforms. Deconstructing a mix like this is a great way to make real improvements in your music production. One of the six cheat-sheets in my eBook ‘Never Get Stuck Again’ is a cheat sheet to help you decode any mix in minutes. Click the button below to grab the free chapter. Tom Frampton is an audio engineer with one driving goal; to help music producers get the best possible results. The past few years have been a whirl-wind for Tom. Mixing and mastering songs for thousands of clients, his plugins being used by tens of thousands and his blog read by hundreds of thousands. Every day presenting a new challenge, and a new opportunity to learn. 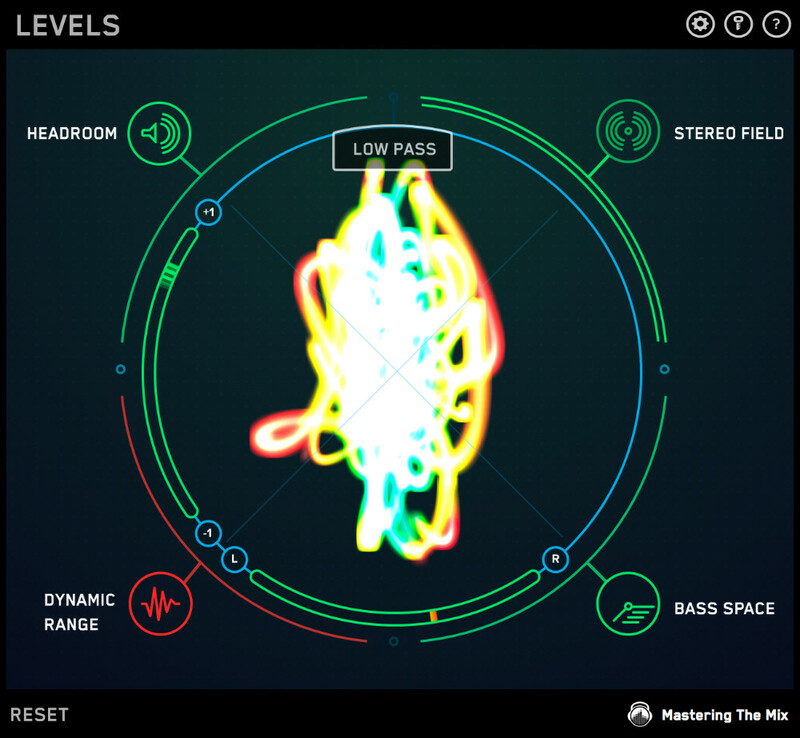 Hearing the music related struggles expressed by his clients and readers has positioned Tom perfectly to uncover unique techniques and workflows to help them create better-sounding mixes. Tom wrote this eBook to compile and share all of his most valuable information into a single resource. Having been involved at every stage of the production process in various scenarios, he found there are some approaches that work brilliantly, and some that guarantee sub-par results. Toms approach to music production, as defined in this book, has opened the door for him to release remixes on influential labels (BMG) and work with world-renowned artists (Tiesto, David Guetta, Calvin Harris, Niall Horan).